Luke Tillen is not only the Founder and Chairman of the Torbay Holiday Helpers Network (THHN) but he is also one of its most active fundraisers. Just this year Luke has run 108 competitive miles in some pretty inhospitable conditions, much of literally up hill and down dale. Starting in April with the London Marathon which Luke completed in a pretty impressive 3 hours and 31 minutes, next up was a gruelling 69 mile ultra marathon in June along Hadrian’s Wall in Cumbria which Luke ran with friend Alick Forrester. Luke’s 2013 trio of runs finished when he completed the Great West Run in Exeter on Sunday 13 October in just 1 hour and 41 minutes. The THHN gives free holidays to families who have seriously ill and bereaved children, recently bereaved families, couples who have lost a child and to families who have a terminally ill parent. The charity is a network of hotels, guest houses, attractions and other businesses who all work with the THHN to provide these holidays but Luke’s recent runs have been specifically to help the fundraising campaign he’s currently undertaking to help the charity take the next step and build a bungalow for those families who have high level care needs and who are not able to use the accommodation currently on offer. Of his runs Luke says “Running is a hobby of mine and I have really enjoyed this year’s challenges however I’d be lying if I said it wasn’t incredibly hard work. The ultra marathon in Cumbria really was the hardest thing I’ve ever done in my life and there were times during it when I simply couldn’t imagine finishing it. However, with the support of my family and my great friend Alick, somehow I managed to cross the finishing line.” Luke completed the ultra marathon in an amazing 15 hours and 12 minutes after battling across unforgiving terrain in terrible weather. He said “It was lovely to finish the year’s running challenges closer to home with the Great West Run in Exeter surrounded by a fantastic group of people who were also running to raise money for the THHN. There was a great atmosphere and I feel so lucky to have such a lot of support. This year we were an affiliate charity of the Great West Run and huge thanks must go to the race organisers who did a fantastic job, all those who ran for us, and to Angels Tea Rooms, Pro Performance of Paignton, Bryony Boyce of Body By Vi, Total Produce Devon, Winners 2000 and Torbay Hospital Convenience Shop who all donated to our runners’ post race goody bags.” Runners were also each given a free post-run massage, courtesy of Dr Sarah Taylor of Smart Practice Sports Massage and her team and the THHN tent was set up in the race village and staffed by the brilliant Brian Lewis and his team of volunteers. 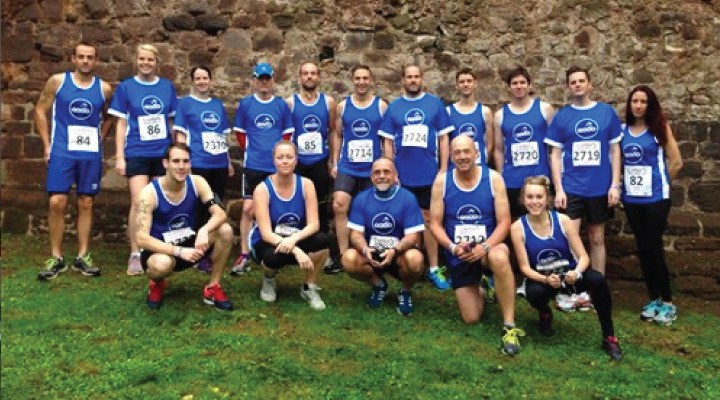 Luke’s total amount raised for this year’s runs currently stands at £3,800 but the total raised by the fantastic running group that is growing all the time has yet to be counted. With Luke’s running credentials and enthusiasm, the THHN attracts lots of runners which is fantastic for its fundraising activities. Luke has actively encouraged this and the THHN has a runners’ forum which can provide support and training plans as well as give the runners an opportunity to interact and chat to each other, they organise group runs and generally try to provide all the assistance their runners need to both enjoy the events as well as help raise vital funds. The runners are very much part of the THHN team. So, if anyone fancies taking part in a challenge here or there and is looking for a friendly group to join, the THHN would be delighted to hear from you. In the meantime, running for the THHN is over for now and it’s the running of the THHN that Luke will be getting on with. The charity is busy twelve months of the year and the number of holidays it can provide increases all the time as more and more generous local businesses join the network and help give these amazing families a bit of respite away from the difficult times they are facing.